CHINESE CARRY OUT…I LOVE THIS STUFF!! There is a restaurant by my house, Ming’s Chop Suey, that has the best egg rolls in the city! Hands down, bar none, these things are addictive! So whenever I get a hankering for Chinese food, that is where I go. Two egg rolls and shrimp fried rice, and I am a happy camper! It’s funny, because I am sure they have been in the same location forever and a day, and I had driven past there on numerous occassions. However, it wasn’t until I began dating my husband that I ever ate there. If I am really honest with myself, the closest thing to Chinese food I ate when I was single was the lucky ginger pasta at Pizza Capri. I have always been more of a pizza girl, when it comes to carry out. When I did order Chinese, I usually got some kind of noodle dish, and egg rolls were never really a big deal…until I had them at Ming’s. Like most things delicious, once I get a “hankering” for something, I will not be satisfied until I find a way to make my own version of it at home. I’ve done this with Pizza, Burgers, Pasta, Salads, and once I get my hands on some beef tallow…fried chicken! But I digress, let’s get back to the egg rolls. As with most things I try to recreate, I had to put my own spin on the egg rolls. To start, I used chicken, instead of shrimp, beef or pork. The ground chicken is leaner, and it really takes to seasonings very well. It’s like the tofu of meats! 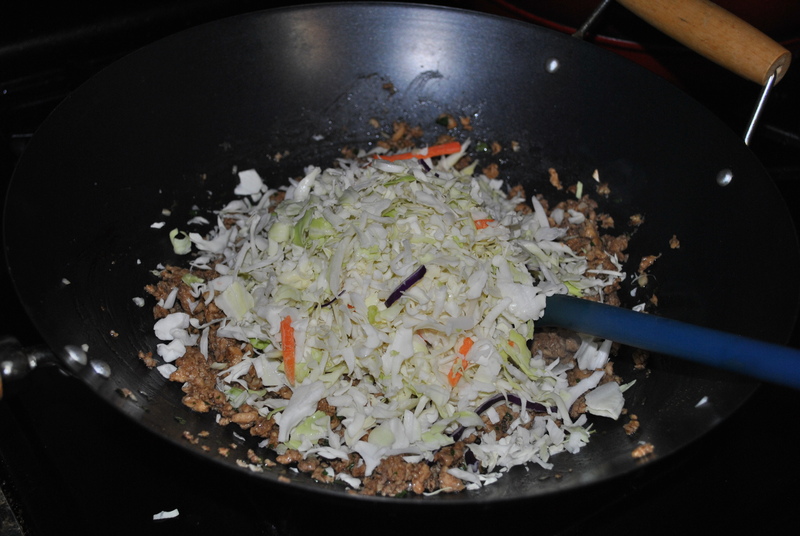 I also had to play around with the seasonings, until I fould a flavor that worked for me. I ended up using Chinese 5 Spice, Soy Sauce, Hoisin Sauce and Garlic. This was truly one of those things where I kept having to taste the mixture, to make sure the flavor combination was just right. In the end, I think I came up with a pretty good egg roll. My husband and father devoured them, so if that is an indication, then I will have to say they were quite tasty! Heat oil in large skillet or wok. Add garlic, cook until soft (be careful not to burn it). Add chicken and soy sauce, cook through. 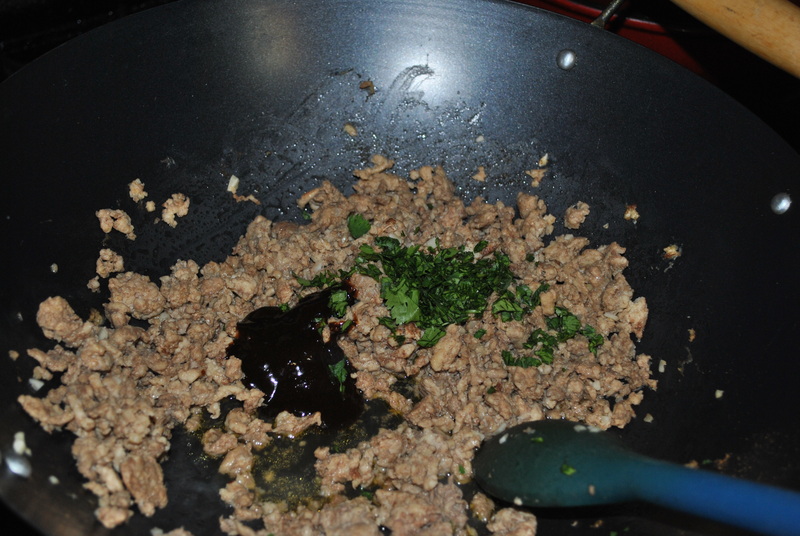 Add cilantro and hoisin sauce, mix well and remove from heat. Add cole slaw to meat, mix well. This part is definitely a preference thing. If you want more meat, less veggies, then add just a little bit of the slaw. If you want lots of veggies, add lots of slaw. For this batch, I added roughly two-thirds of the bag of slaw. In a small bowl mix egg and 2 tbs of water. Open egg roll wrappers and remove from packaging. 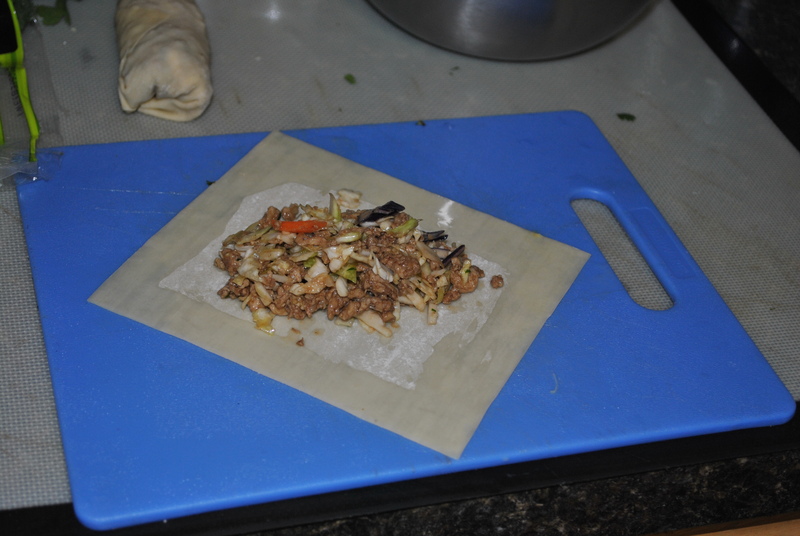 Starting with first roll, take one sheet of wrapper and lay on cutting board, brush edges with egg wash.
Add meat mixture to center of wrapper. 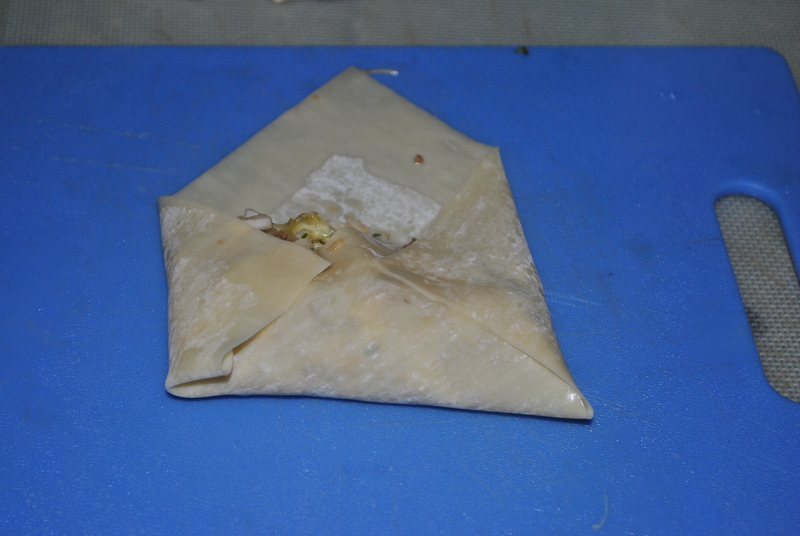 Starting with bottom corner, fold wrapper up, over filling, then fold in sides. (It’s just like when you are making a burrito or wrap). Tuck sides and roll until closed. 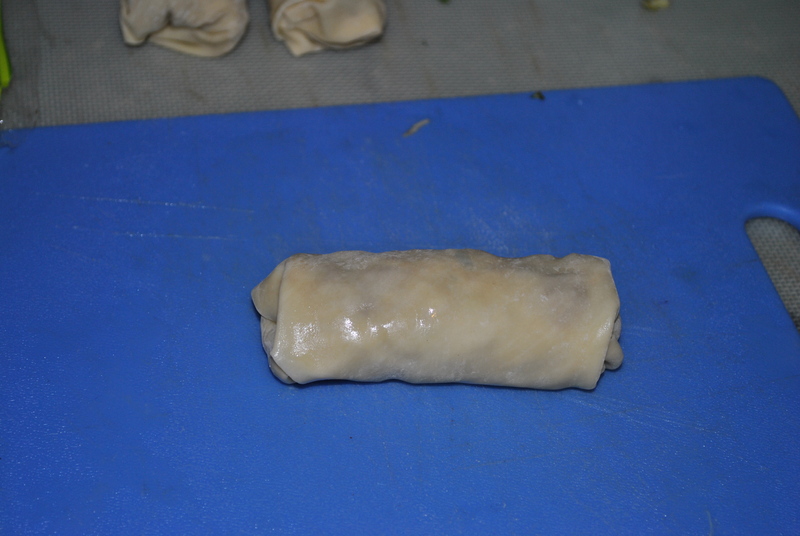 The egg wash will act as a glue, holding egg roll together. Continue with remaining wrappers until all of the filling is gone. I usually get 12 egg rolls. I know I have said this a few times throughout this post, but here I go one mo’ gin!! This is a preference thing. The egg rolls can be baked or fried. Frying Method: To fry them, heat up your oil in a skillet or deep fryer to 350 degrees. Once oil is hot, drop in egg rolls and fry. You will have to turn them while they are frying to make sure all sides cook. Once rolls look brown on all sides, remove from oil and drain. Baking Method: Pre-heat oven to 400 degrees. 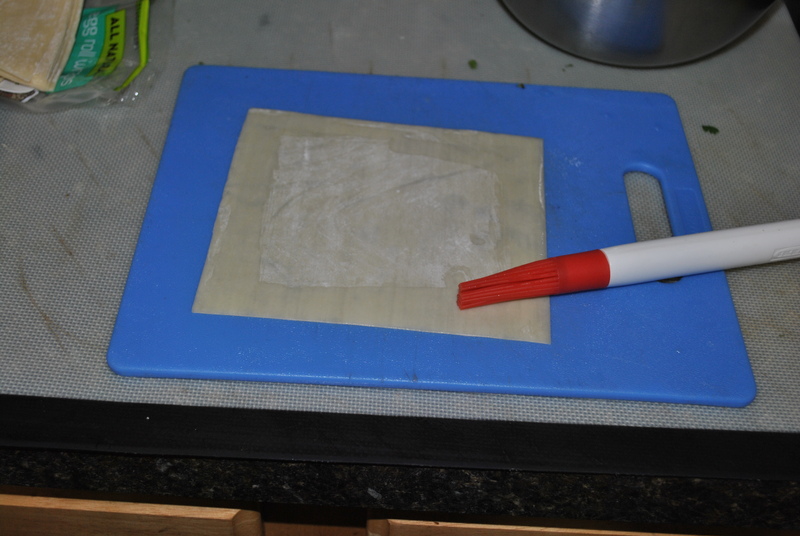 Spray outside of rolls with non-stick cooking spray and place on a baking sheet lined with parchment paper. Place in oven and bake for 15 minutes until golden brown. Note: I fried my egg rolls. I have nothing against baking them, but today, I wanted them fried! Here is the final result! 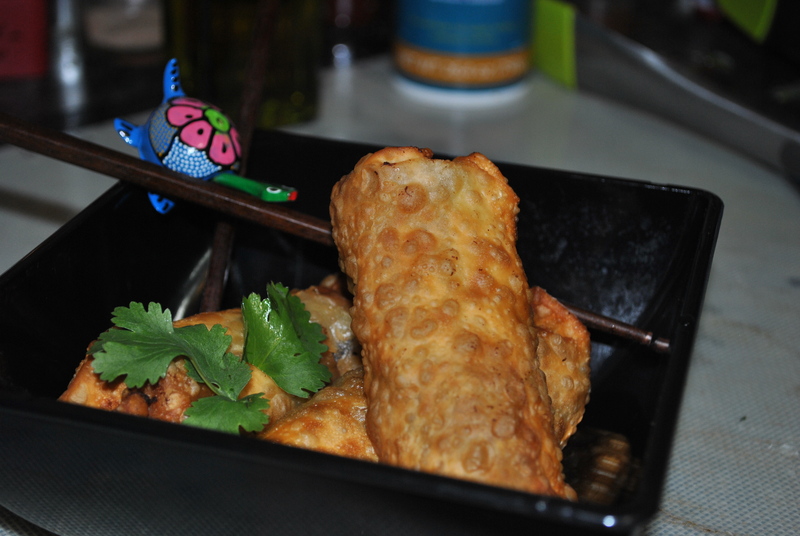 4 Responses to "Friday Night Cravings…Chicken Egg Rolls"
Those egg rolls look so GOOD! I’ve never cooked egg rolls but always wanted to. I am going to try this recipe out this evening. Thanks for sharing! The egg rolls turned out great! My Love is not a fan of cilantro so I substituted Italian parsley. This recipe offered one of the best egg rolls I ever tasted and they are fairly easy to make. We ate them on Friday and again for Superbowl Sunday. I took an egg roll to my mom and she loved them as well and now wants the recipe! This chicken egg roll recipe is now a staple in my kitchen. Thanks for sharing! So glad you liked them! And what a great substitution for the cilantro! !